In our last installment we got about as technical as we’re going to get in this series. We covered some of the most important things to know if you want to get better at every-day kinds of photos, without spending any time in the nitty-gritty. You’re not trying to be the next big photographer, you’re just looking to take photos with your phone that won’t be distractingly bad. It’s not a high bar to reach, but good vibes and thinking really hard isn’t going to do it. But, that’s behind us now. If you missed that entry in the series, go back and check it out. If you do, the tips and advice to come will settle much more easily into your habits. This week, we’re putting the technical stuff down and we’re going to spend a little time talking about what really makes a photo any good—the mind of the photographer. What’s going on in there? How can you think a little more like a photographer? As you’ve surely heard many times before, a bad photographer with a good camera doesn’t usually impress anyone, and a good photographer with a bad camera can still knock your socks off. Luckily, if you have a modern smart phone, you have a good camera. No, not one you’d go and shoot a football game with, or use to capture a wedding, but absolutely good enough to create some beautiful images of your family while you’re out and about, enjoying each other, or simply just trying to preserve a moment in time. It’s all about what you choose to do with your mind—namely, how you exercise curiosity in any given moment. It always starts with questions. So lets dive right in. If you float around the right circles, you may hear photographers talk about “The Breath”. No, that’s not a reference to anything metaphysical, and it’s not some hippy-dippy concept of the connectedness of all things (however true, or bonkers that might be from your perspective). It just means stopping what you’re doing for long enough to ask yourself some questions; long enough to ‘take a breath’. Modern cameras, smartphones being no exception, beckon us to “spray and pray”. To simply hold that shutter button down and take as many photos as possible. This has two primary problems. The first is that after you do that, you suddenly have hundreds of photos. That might not be a problem if you’re genuinely interested in photography as a dedicated hobby, but for everyone else—everyone this series is written for—it means you’ll probably never go back and pick a few you like the best. It’ll clutter your photo stream on your phone, and make it harder to identify any particular image or moment as meaningful or special. Algorithms, as of writing this, aren’t very good at doing that for you, so you’d have to do it yourself, and you probably won’t. The other problem with doing it this way is that it lacks any ‘exploration’ to figure out what would make the photo the best it could be. All 37 images you captured in that “spray and pray” are basically the same photo. The changes will be subtle and not especially meaningful, exacerbating the trouble you’ll face trying to pick a favorite. The fact that your camera can capture so many images in rapid fire is not “how the camera is supposed to be used”. It’s a tool, a feature, that should be used when you’ve already considered everything else. Getting a good photo is not about getting lots of photos, it’s about thinking and asking the right questions. Those questions, put succinctly are: why this? Why now? Why here? And, why in this way? Some of these questions you can run through really fast. Some of these questions will trip you up and force you to think. That’s the whole point of taking that breath: thinking on purpose. For most of you, this question is probably the easiest to answer for yourself. “Because this is my kid and she is cute”, or “This is my fiancee and I love them”, or “This is my dog and he is being crazy”. But, the question gets a little trickier when the subject of your photo isn’t as clear. In a new city full of interesting buildings, why take a picture of this building. Or, at a dinner party with fancy food, why take a picture of this dish? There isn’t any right or wrong answer. The most important thing is that there is an answer. “Because the building reminds me of Blade Runner”, or “Because I want to get better at food presentation and this plate is beautiful”. This question helps you notice when you don’t need to take a photo at all. It helps you determine if you actually care about this thing in some way, or if you’re just pulling up the camera because it’s there and you’re bored. 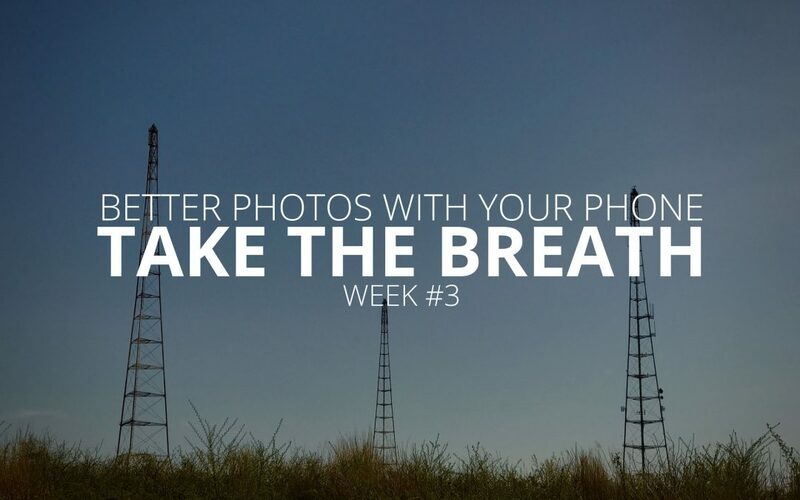 Fewer purposeless photos means you’ll actually want to look at more of the photos you take. Answering this question helps give your photos purpose and acts as a guide to answering the rest of the questions. In many circumstances, this is also an easy question to answer; “Because this is when it’s happening”. If you’re at a concert and want to take a picture, right now is the only time to do that. If you’re at your friends birthday party and their opening the gift you got them, right now is when that’s happening and right now is the only time to take a photo of it. But, unlike the last question, which can often help you take fewer unnecessary images, answering this question can help you take more meaningful ones. Think about this—say you have this vague idea that you want to take a photo of your kid on their first day of school. As they’re walking out the door, you think to pull out the camera for a photo. When you take the breath and ask yourself this question, “Why now”, you think “because they’re looking cute and excited and nervous before school”, which leads you to suddenly realize that there is more than one good time to take this kind photo. You can take the photo on the way out the door for the reasons you gave yourself, but maybe you should also take it again when they’re coming back in the door to see how those expressions have changed. Again, there’s an easy way to answer this question—“Because right here is where it’s happening”. But, that answer is much too broad to be useful, and it’s not what I have in mind. The question “Why here” doesn’t mean “why in this room”, or “why in this restaurant”, it means “why in this specific spot”. Think about the concert I mentioned before. Is the exact spot your standing really the best place to take the picture? Would it be better if you took one step to the right? Would it be better if you walked up to the balcony, or over to the other side of the stage? “Why here” asks you to get granular and think about where your standing and where your subject is relative to yourself. In another example, think about the photo of the kids on the first day of school. Is the front stoop really the best place to take the photo? Would it be better if the kids were sitting on their bed? Would it be better if you were standing inside pointing the camera out the front door, or outside with the door behind the kids? This is a fundamentally important question when you’re taking a picture you even remotely care about, and it’s really where the rubber starts to hit the road. The last two questions deal with whether you should even take the photo in the first place—this question is your first chance to notice and do something that will actually make the photo you take better. Finally, this last question on our list today is our most complicated—though we won’t explore every angle. Most of them don’t matter to you. This question is where almost all of your ‘creative’ choices are made. If you don’t so much care about creativity, you can skip this question. But I don’t suggest you do. Even an ounce of creativity in the otherwise mundane everyday photos brings a lot of life to them. When a photographer asks “why in this way”, they’re thinking of things like whether they should hold the camera vertically or horizontally, whether the lighting is right, whether the “pose” looks good, whether the camera settings give the effect they want. But when you ask this question, focus just on two things—how you are holding the camera (horizontally or vertically), and whether there are any smart phone camera effects you want to use. If you’re taking photos of something taller than it is wide (such as a person, or a clock tower), hold the phone vertically. If you’re taking a photo of something wider than it is tall (such as a group of people together, or a sunset), hold the phone horizontally. And, now is the time to try out some of the phone’s effects, try the background blur setting and see how it looks, try it as a panorama, or if your phone has two lenses on it, try the zoom feature an see if you like the look. Questions are the sinuous foundation of almost everything creative, and taking a picture with your phone absolutely counts. Moreover, in many ways, “art” is defined by intentions, and our intentions become clear when we ask ourselves relevant questions. The next time you pull out your phone, take the breath, and run through these questions in your head. After you’ve answered them for yourself, enjoy your effort with a better photo. Next week we’ll be talking about the relationship between the person holding the camera and the person or thing being photographed. Stay tuned!